Enter a fantastic universe beyond time and space. A universe filled with strange technology, stranger cultures, exotic locations, and incredible danger. The known universe is ruled by the immortal Tyrant and his oppressive 149,000 year regime. 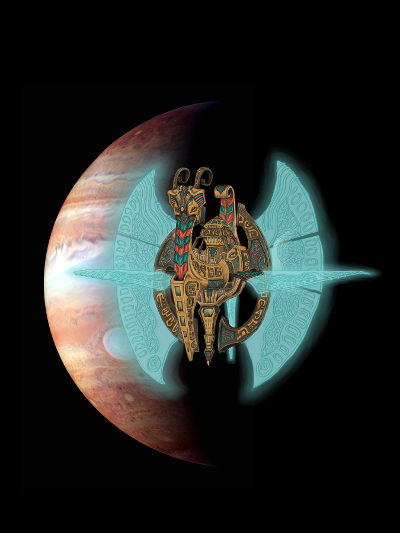 Genetically-engineered, flesh-and-blood Pharisto gods rule over humanity and alien alike. Biological minds whose intellect approaches that of machines, shape-shifting genetic clones in search of individuality, and atomic-scale clockwork mechanicals given sentience are just some of its denizens. Enemies within and without plot to bring down the eternal Dominion. Interdimensional invaders lurk beyond space and time, plotting their next incursion. Unfathomable aliens stalk humanity, corrupting and enslaving their victims for strange purposes. Once more, the rebellious machines, betrayers of humanity, threaten to escalate the millennium-old cold war. Meanwhile, the Pharisto houses further their schemes, eyeing the Tyrantine Throne of the golden planet, Baroque, for themselves. Grab your energy projector and activate your shunt shield. Voidship fleets are moving into position. The pieces are falling into place. Which side will you choose? Will you enforce the will of the Tyrant to ensure the stoic Dominion endures for another hundred millennia, or will you become an Arch Heretic to tear down this suffocating and corrupt regime? The choice is yours. 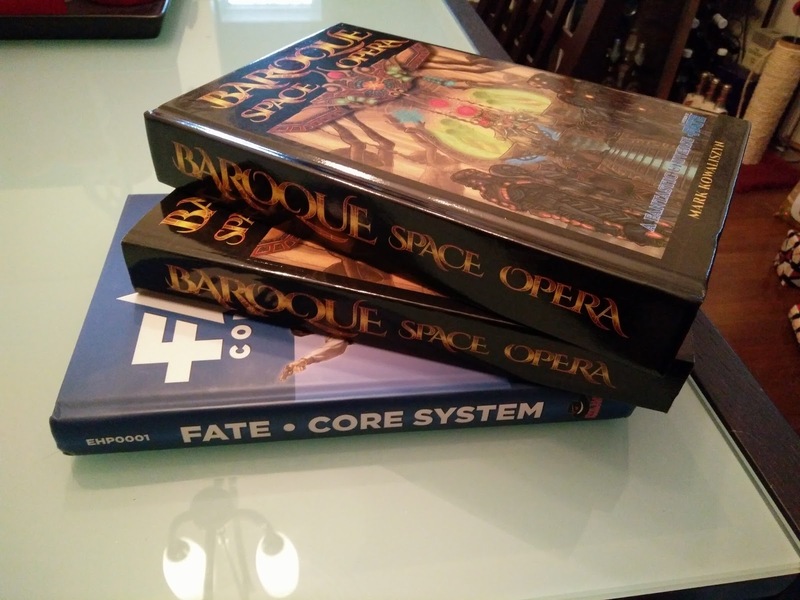 Baroque Space Opera is a complete setting for use with Fate Core; it requires a copy of Fate Core to play. If you are a fan of Dune, The Metabarons, Star Gate, Lexx, Farscape, and the Ancient Astronaut Theory, you will enjoy the Baroqueverse. A detailed treatise on the Dominion of the Tyrant. The incredible technologies of the Baroqueverse. 63 exotic locations that are packed with plot hooks. Over 20 character archetypes to choose from. Nanotechnological Dust technology that is indistinguishable from magic. Navigating the virtual realm that is the Pattern. Beneficial Things mechanic for gear, companions, vehicles, and everythng else. 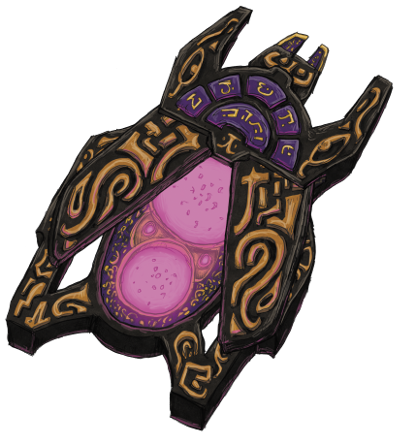 Voidships mechanic for creating starships and using them in your games. Plenty of pre-generated adversaries, voidships, and equipment. A map of the Baroqueverse. The only difference is that the colours in Premium are just a hint stronger than in Standard. The differences are very subtle and it is very hard to tell the books apart. The paper quality feels the same in both. taken as positive or negative , depending on context ." Have you tried another PDF reader? The box text is visible both in digital and in print. Discount codes have been sent out to those who purchased the PDF before December 31st, 2015. I have not received a code. Hi Jason. You may have your DRTRPG settings set to prevent publishers from contacting you, or it is in your spam box. Please forward your DRTRPG purchase confirmation email to my email listed on the 2nd page of the PDF and I'll send you the discount codes. My mistake! I purchased it as part of the Bundle of Fate from the Bundle of Holding late last year. Does the Humble Bundle purchase qualify for the purpose of a discount code? Hi Jason. No, the Fate Bundle +3 does not qualify for the pre-purchase of the PDF. The reason for that is that the book in the bundle was very heavily discounted already. Fair enough. Just thought I'd check! I want to purchase this, both as a PDF file and as a book. If I purchase the PDF now and the book later, will I be penalized in terms of cost more than if I wait until the PoD is ready? Hi. No, you will not be penalized. Everyone who purchased the PDF will receive a code to purchase the book at a cost equivalent to the book and PDF. I'm just waiting for the proofs to arrive (they were already shipped) before I can make the print book available. How are the proofs looking? They look awesome. The minor updates I made to the final copies were approved today. The print version should be available any moment (hopefully today). Baroque Space Opera has been updated in prep for print. It now includes the back cover, a lexicon, and a quick reference section for all the rules in the book. Character and Voidship sheets were also added. Mark, I think that you need to have a Copy Editor look over the book, as you have a lot of mismatched grammar in what I have read. Bryce, could you be more specific? The book uses Canadian/UK spelling. You can contact me via email it's on the license page in the book. Mark - I notice that you're based in Berlin. So, as it happens, am I! Any chance you'd be up for running this sometime locally, perhaps at one of Otherland's Thursday night gaming nights, or as part of the Berlin Pen-and-Paper RPG meetups? I'm actually based in Toronto, Canada. What made you think I'm in Berlin (curious)? Ah, the DTRPG timestamps are confusing... they put the time for a post and amend it with the location of the user's location, not the poster's. Very strange. Fear Gas Orb- (1 stunt, 1 trouble, 3BP) +Hallucination Gas. -(trouble)Blown away in high wind. 1 zone Area Effect. +1 (Average) Hallucinogenic Gas-- Bronze Rule character. Create Advantage aspect on first turn and each turn targets stay in zone versus Physique. A success Creates Advantage Aspect "The Walls are Melting", or similar. Must Overcome aspect to act normally. Takes only one stress to overcome. You can use the Bronze rule and specify broad skills instead of introducing a different rule set such as FAE. The Bronze Rule pretty much works the same when using broad skills. You use the term story quite a bit. Such as, "taken out to the end of the story." FATE uses Scene, Session, Scenario, and Arc. Do you define story anywhere in the book? Fate Core uses story interchangeably with Scenario and story Arc throughout the book. I don't believe it needs to be defined. Mark I am not trying to be a pest. I have played FATE since the Kickstarter. I have been playing since the first PDF came out. I checked in the FATE Core book before I asked the question (as I have done with all my questions). FATE does use the term story a lot mostly to discuss narrative concepts and in story time. Under Scenes, Sessions, and Scenarios the rules outline how to create a Scenario, which I think you are confusing with the word "story" in Baroque. This becomes even more significant when discussing milestones for advancement. A Minor Milestone is reached at the end of a session. A Significant Milestone is reached at the end of a Scenario (at no time in the book called a story). A Major Milestone is reached at the end of an Arc (defined as several scenarios). There is more flexibility than this and is detailed in chapters "Scenes, Sessions and Scenarios", and in "the Long Game". I want you to be successful. I like this setting, but if you are going to define Story to mean...See more something equivalent to Scenario you need to define it. Otherwise, you will be confusing many long time players. p324 under benefit and trouble aspects you indicate that "if you have multiple free invokes stacked on a single aspect, you may not invoke both at the same time." If you read FATE Core p70 Free Invocations may stack. So I don't know if perhaps you are mixing terminology. If someone uses Create Advantage action they have the potential of adding a further two Free Invocations to the benefit aspect. So are your free invokes more "free uses" that can't be stacked or are they actual Free Invocations which can be stacked according to FATE Core? Good question. Beneficial Things are an extra: a rules addition to Fate Core and provide new terminology in the form on Benefit Aspects. Fate Core only lets you use multiple invokes on Create an Advantage Aspects, and not normal aspects, which do not have additional invocations. Benefit Aspects are a bridge between the two types of aspects; they let you have multiple invokes, yet you are not permitted to invoke each more than once per action. This limitation exists for balance reasons. Create an Advantage costs you your action to use, and if you succeed with style, you get 2 invocations. Since you do not need to spend an action and get free invokes on Benefit Aspects, a measure of balance is maintained. If there was no such limit, you could drop bombs on your rolls that could potentially be anywhere between +2 and +6, or more (at no fate or action cost), depending on how many Benefit Aspects you gave your Beneficial Thing. Anyhow, that's the reasoning for said rule. If you don't like it, feel free to make a house...See more rule. Let me repeat this back so I understand. A Benefit Aspect can only be invoked once per action. You can invoke it with a FATE Point or with the attached "free invoke" but you may not stack these types of invocations. You have one "free invoke" per story (see other question about "story"). The exact wording is: "The beneficial aspects may be invoked, for free, at least once per session by you; the GM may also invoke the trouble aspect for free, once or twice per session." (pg. 324). The standard Fate Core rules of invoking an aspect once per action still applies, whether that is as a free invoke or with a fate point. You have as many free invokes as the Beneficial Thing was designed with, per session. Some have one, some have more per aspect on them. You can see the pre-generated ones for examples. So in a way it is like the old "Signature Aspect" stunt from Spirit of the Century. It allows you to invoke that aspect once per session just as if you used a Fate Point; without actually using a Fate Point. There doesn't seem to be a plain old human archetype? Can you be a Hereseer without being a pharisto? So I could be an exalted hereseer? Can you be an exalted Amaranthine? Is there a character sheet? There will be one, when the print version is completed. The electronic PDF will be updated. It will include the character sheet, voidship sheet, and a Lexicon. Awesome stuff! I've gone through 2/3 of the book. I'll be contributing a list of errata to you somehow if it will help perfect the print version. Quite eager to see the POD version of this. Any ETA on that? Any chance of this coming out in a system other than FATE for those if us that still like a little crunch? No plans at this time, but who can tell the future? I structured the book in such a way to separate the system from the background material. It should be pretty easy to adapt it into your favourite system. The setting is at the front, the mechanics at the back. Hey Adrian, the page count is listed for every product in the right side bar on the product page. This one is 428 pages. Learn something new everyday. :) Thanks. That's good and meaty. Don't be so sure about that last statement ... the previews looks as if you had asked me personally what setting to design - only that I couldn't have put my finger on it before seeing it. I'm pretty sure that this will do a lot of the things that I was looking for in Fading Suns and Numenera (both great settings), but couldn't quite find there. I'll may have to go for the pdf after all, since I can update it to POD later anyway.